Happy 82nd Birthday, Pope Francis! As Pope Francis celebrates his 82nd birthday on Monday, well-wishers in the Vatican and around the world send their greetings. The Pope’s birthdays are always memorable occasions: last year, he threw a “Pizza Party” in which he served a 4m long pizza. The year before that he hosted a birthday breakfast, to which he invited 8 homeless people to taste sweets from his country of origin – Argentina. Three years ago, thousands of people gathered to dance a tango “en masse” for the Pope in St Peter’ Square. This year the Pope chose to celebrate his birthday a day early, by throwing a small party for himself and a group of children who are receiving medical care from the “Santa Marta” Paediatric Dispensary inside the Vatican. 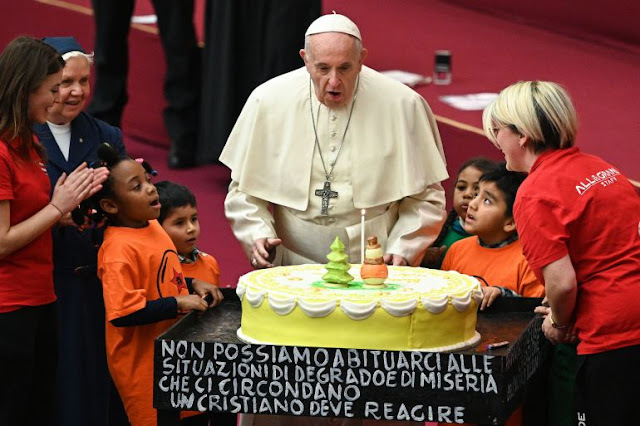 The children surprised him with a huge cake and the Pope thanked them, expressing how glad he was to be with them. The atmosphere was so warm that the Pope stated that he thought that if the Holy Family had been living in Rome and the Baby Jesus had had a cold, Mary would have surely taken him to the dispensary to be treated. The children at the dispensary, said the Pope, have so much to teach us.